Dartmouth, MA – The Community Foundation of Southeastern Massachusetts (CFSEMA) – New Bedford Education Foundation Fund is pleased to announce the awarding of a grant to the Lloyd Center for the Environment for summer programs with the New Bedford Boys and Girls Club. Thanks to the generosity of the Community Foundation, children from the New Bedford Boys and Girls Club have been visiting the Lloyd Center over the summer to participate in programs specifically geared for them. Coastal Field Studies (adapted for each grade level) are hands-on coastal ecology adventures! 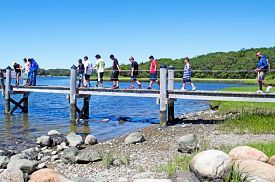 Held at the Lloyd Center’s unique coastal nature preserve in Dartmouth, students have explored the ecosystem and a variety of coastal habitats. In experiencing these unique habitats, students have been given an opportunity to utilize scientific equipment, follow field guides, and create data-sheets. They have also toured the Visitor Center, seen pertinent natural history exhibits, engaged in saltwater marsh exploration, and have caught and observed organisms on their own in the Slocum River estuary. 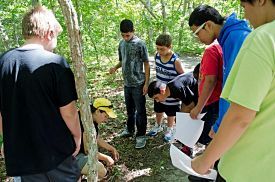 In the Forest Exploration program, students explored a maritime forest with a Lloyd Center Naturalist. They learned about different types of trees, and searched high and low for residents of the forest. The exploration culminated in a team scavenger hunt. In For the Birds, students were able to get up close and personal with the Lloyd Center’s resident Screech Owl and discover the mysteries of migration through an interactive game. Students also went on a bird-watching hike on the Lloyd Center’s Hardscrabble Nature Preserve. In Reptile Romp, students discovered the world of reptiles and amphibians! Students sought out reptiles and amphibians on the Lloyd Center’s property and handled live specimens from the Lloyd Center’s collection. The season ended this week with a Coastal Field Study and a Canoe Trip for 12 and 13 year old girls. Students paddled on the Slocum River while a Lloyd Center Naturalist pointed out wildlife and described the natural history of the area. The Community Foundation was launched in 1995 by a group of dedicated volunteers who wanted to create a new avenue for encouraging philanthropy in the area. Its mission is to improve and protect the quality of life here by promoting collaboration and understanding among all members of the community; by providing a flexible permanent vehicle for donors with diverse interests; by protecting the community’s endowment through prudent investment and effective stewardship; by expanding the community’s endowment through appropriate solicitation; and by ascertaining community needs and opportunities and acting as an informed grant maker.